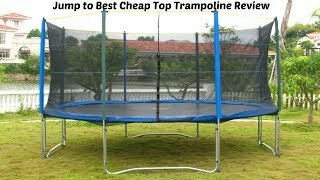 Trampoline with enclosure is been around for long time safety equipment and is a great form of a safer exercise and recreation for children. The most important purpose of the Trampoline net is to avoid such injuries and harm to children to fall off of the trampoline. In Trampoline net spotters would stand on the ground at each side of the trampoline, hoping to push a jumper back on the trampoline if they came too close to the edge. The Trampoline with enclosure, the risk of injury to both the jumper and the spotter is greatly reduced. These net trampoline with enclosure replacement nets are designed to fit Trampoline net enclosures. However, with adjustments, these Trampoline nets can fit any brand of the trampoline with enclosure. The Trampoline nets are woven from UV-resistant and durable polypropylene and are lined with elastic along the borders to ensure a snug fit. It laces along the perimeter of the jumping mat along in the net trampoline. Trampoline net with enclosure for a Trampoline safety is no joke. We want you to enjoy a safe experience with the least possibility of injury with our Trampoline net. We are proud to offer a variety of safety equipment of Trampoline net for any brand of Trampoline net and we want to make sure that you and your kids can jump safely. This Trampoline net is a simple design and fits all trampolines up to 15 feet in diameter. Used trampoline with or without jumper enclosure, it improves trampoline appearance and increases trampoline usage of the Trampoline net.